The problem was the feds had just demanded that auto workers abrogate their hard-won contracts before Detroit got a bailout. United Auto Workers leaders complied, sacrificing “job security provisions and financing for retiree health care,” plus agreeing to cuts in base pay, overtime pay, break time, raises, skilled worker positions and chopping wages for many new hires in half to $14 an hour. Far from failures or mistakes, these episodes illustrate how Team Obama, which surfed a tsunami of corporate money and savvy branding to victory, is doing exactly what it was elected to do: redistribute money upwards. It’s hard to think of a decision by this White House that would have not elicited cackling glee from the Bush administration. The number of horrendous policies enacted by the Obama administration in barely a year boggles the imagination. What follows is by no means an exhaustive list, just a few dozen of the worst. Even Time magazine has concluded that “Obama’s Latin American Policy Looks Like Bush’s.” While many hoped Obama would lift the 48-year-old embargo against Cuba, Obama loosened a few restrictions only for Cuban Americans. Last April, Obama declared the United States a “full partner” in Mexico’s calamitous drug war. Months later, the White House slapped Bolivia with economic penalties, allegedly for not being an enthusiastic drug warrior, but more likely for pursuing an independent agenda. And there is the Honduran coup, which Obama endorsed by recognizing the rigged election in November. Most ominously, his administration inked a deal in October for seven military bases in Colombia, convenient for launching new wars against socialist governments in the region. Before Van Jones was thrown under the bus, Obama promised to create five million green jobs in plug-in hybrids, weatherization, renewable energy, biofuels and clean coal. Biofuels and clean coal? Okay, maybe it’s a good thing this promise was snuffed. But as Naomi Klein points out, between the stimulus, the auto bailout and the Wall Street rescue, Obama had the leverage and political capital to fund mass transit and a smart electrical grid, restructure government-owned automakers to focus on green technology and force bailed out banks to fund industrial restructuring and green infrastructure. Instead, we get a White House vegetable garden the size of a New York apartment. While the original Troubled Assets Relief Program was “only” $700 billion, the program’s watchdog estimates taxpayer money at risk is a phenomenal $23.7 trillion. The Obama administration has been more interested in defending obscene executive pay, blessing more of Wall Street’s highrisk trading, stonewalling on how the TARP funds were used and abused, and resisting real regulation, rather than prosecuting Goldman Sachs and other banks that peddled risky mortgage- backed securities while secretly betting they would plummet in value — a textbook case of securities fraud. But what do you expect from a candidate who raked in the most dough from Wall Street, real estate, commercial banks and hedge funds? In comparison to the bank bailout, relief for homeowners is limited to a miserly $75 billion under Obama’s Making Home Affordable program. As of December, only 31,000 homeowners have received permanent mortgage modifications. The real winners are loan servicers. Of the top 25 participants, 21 were “heavily involved in the subprime lending industry.” The parent companies of the lenders, which have vacuumed up more than $21 billion from the program, include Bank of America, Wells Fargo, JPMorgan Chase and Citigroup. Homeowners in the program who don’t get permanent help are left with wrecked credit scores while they continue to pay for homes they can’t afford, which may be lengthening the crisis. Meanwhile, the number of homeowners with mortgage debt greater than the value of their homes was 23 percent as of September and could peak at 48 percent in 2011. Even modest measures, such as allowing bankruptcy judges to lower mortgages, were abandoned by the Obama administration. There is a method to Obama’s madness. First, his economic philosophy is to subsidize private entities to provide public goods. Second, his main tactic is to appeal to bipartisanship. (Never mind that there was plenty of bipartisanship during the Bush era when Democrats surrendered to virtually every heinous decision.) In the case of healthcare, a much simpler and more effective single-payer system was rejected because Republican support was supposedly needed. The bipartisan tactic allowed the Obama administration to replace single payer with a fake public option that was then dropped. As for the healthcare bill, it will skim $500 billion from publicly funded Medicare and Medicaid and use it to subsidize individuals who will be forced to buy for-profit insurance or pay a fine. The bill does nothing to control costs, ensure quality coverage or prevent workers from losing job-related insurance. It allows for wildly different rates based on age and region, and will deliver millions of new “customers” to insurance and drug companies and for-profit hospitals. Despite reportedly pouring $450 million into Obama’s campaign and providing thousands of volunteers, organized labor has been unable to advance its main cause: a bill called the Employee Free Choice Act that would make it easier for employees in a workplace to unionize. The Obama administration says it is committed to passing the bill, but it has not put any muscle behind it. That may be because wealthy Obama backers, including three Chicago billionaires who own hotels, vehemently oppose the bill. 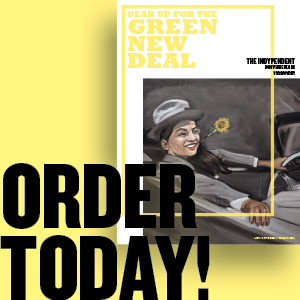 For more on President Obama’s first year in office see “Let’s Break from the Party of War and Wall Street” by Stanley Aronowitz and “Waiting for the Rapture” by Nicholas Powers in this issue of The Indypendent.